Microsoft Corp #Gold #SP500 The market is just a couple of days away from #Microsoft next earnings report (30 Jan 2019) and thus far, it’s looking fairly encouraging. At time of writing, it’s trading around 107, needing above 110 to give some optimism as this should prove capable of an initial 115. 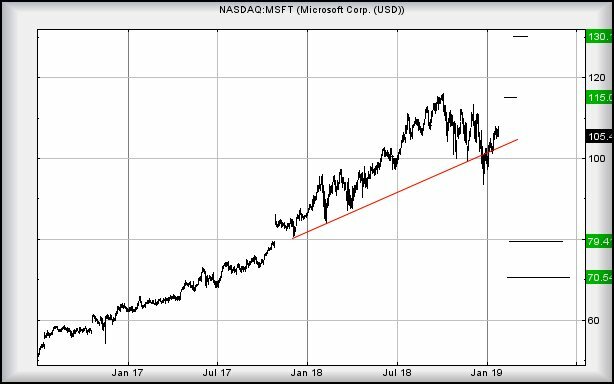 Our secondary, if bettered, is perhaps more important as, should Microsoft better 115, it calculates as capable of a new all time high at a believable 130. Despite the drops at the end of last December, we’re inclined to a degree of optimism here, if only due to the effort made to regain the uptrend since 2017. In fact, were this a UK listed item, we’d suspect the drops to be an effort to trigger stops, along with sell orders, prior to any rise! Contrary to such a jaundiced view is the important detail the price was not simply spiked downward, it dropped and stayed down for a few sessions. Perhaps it was indeed an early warning of coming trouble. We’d certainly be alarmed at any reversal now below 100p as this calculates with the potential of a trip to 79 initially with secondary, if broken, down at 70. If only due to liking Windows 10, we’re inclined to suspend distrust and suspect Microsoft shall head upward again! All will be revealed late on Wednesday evening.